It has long been known that people are not moved by facts or reason, but rather by emotion. 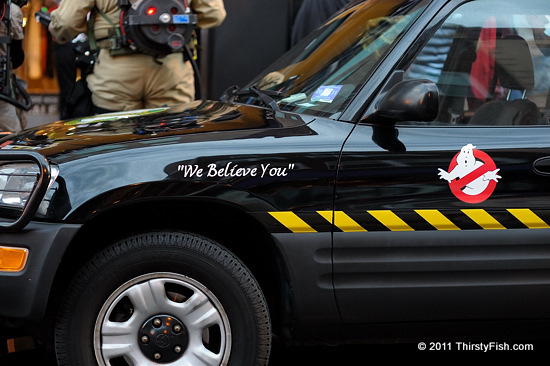 The original GhostBusters film was released in 1984, over 27 years ago, yet there are still people dressing up in GhostBusters costumes and decorating their cars. So, what were some of those evoked emotions, to have such a lasting effect? Well, I'm not going to answer that question, and stick to my boring reasonings. GhostBusters is a great movie by the way, make sure you see it, if by any chance you haven't already. Most of us fail to realize how much we are being exploited through our emotions. Look around you, and find a thing that you bought but you really didn't need or it was of no real use. What made you buy that thing? Think again, why did you really buy it? Was it the "cool factor". Was it envy? Was it fear? Or, was it boredom, or anxiety, or ... that made you buy it? But emotional exploitation is not limited to marketing. We choose politicians the same way. If you pay close attention, you'll notice that there is little substance in what they are saying, but a lot of emotional words, glittering generalities, or as I shorthand it, emowords. With a little effort, it is easy to pickup on the obvious emowords, emoacts and emoideas. The less obvious ones are next to impossible to pickup on. That being said, there is nothing wrong with being emotional, or being driven by emotion. Emotion in itself is not destructive, but when it overpowers facts and reason, forcing us to neglect, ignore or suppress reality, it can have a devastating effect both for us and those around us. People readily present reason and emotion as opposing or incompatible forces; they can be, but they don't have to be. On the other hand, very few of us are blessed with the natural ability to parallelize reason and emotion... Most of us live in la la land as ghosts. And of course, you're not a ghost! On a final note, is there something wrong with a society that rewards clever people who best exploit our emotions, while many providing us with significant facts are ridiculed or suppressed?